Over the weekend I've been in Tirana, Albania for OSCAL 2018. The crowdfunding campaign to buy hardware for the radio demo was successful. The gross sum received was GBP 110.00, there were Paypal fees of GBP 6.48 and the net amount after currency conversion was EUR 118.29. Here is a complete list of transaction IDs for transparency so you can see that if you donated, your contribution was included in the total I have reported in this blog. Thank you to everybody who made this a success. 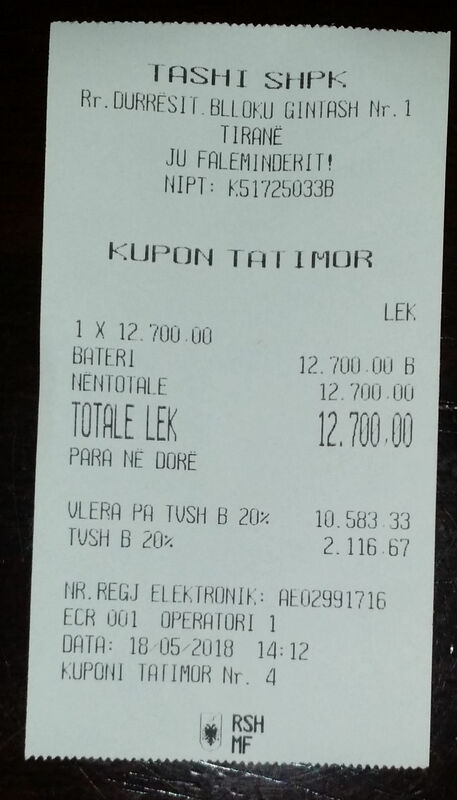 The funds were used to purchase an Ultracell UCG45-12 sealed lead-acid battery from Tashi in Tirana, here is the receipt. After OSCAL, the battery is being used at a joint meeting of the Prishtina hackerspace and SHRAK, the amateur radio club of Kosovo on 24 May. The battery will remain in the region to support any members of the ham community who want to visit the hackerspaces and events. 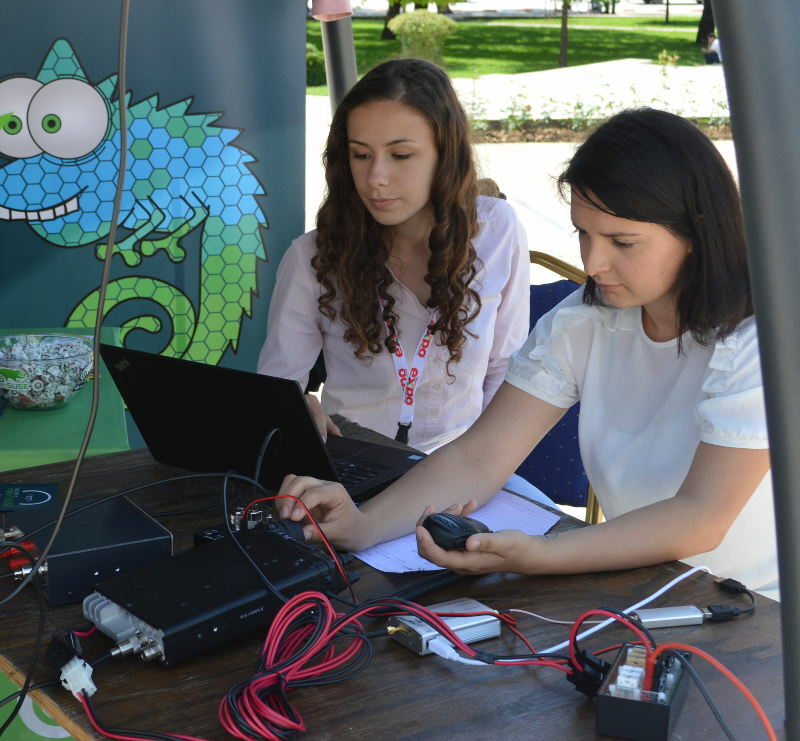 Local volunteers from Albania and Kosovo helped run a Debian and ham radio/SDR booth on Saturday, 19 May. 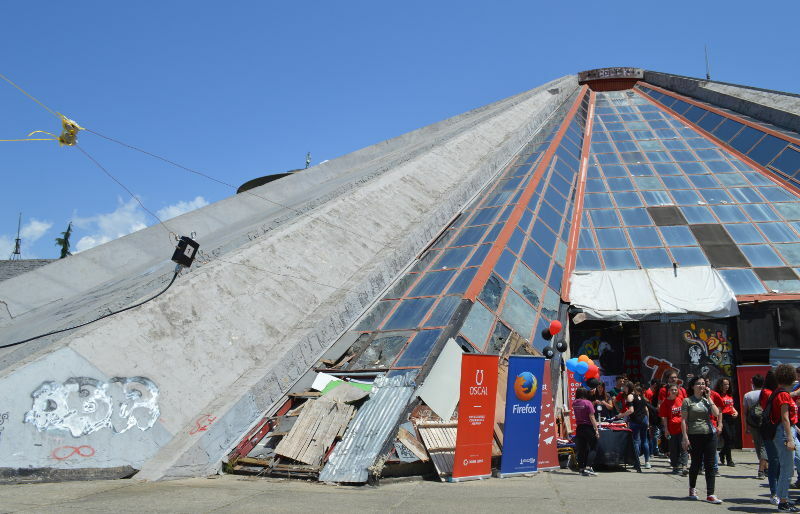 The antenna was erected as a folded dipole with one end joined to the Tirana Pyramid and the other end attached to the marquee sheltering the booths. We operated on the twenty meter band using an RTL-SDR dongle and upconverter for reception and a Yaesu FT-857D for transmission. An MFJ-1708 RF Sense Switch was used for automatically switching between the SDR and transceiver on PTT and an MFJ-971 ATU for tuning the antenna. I successfully made contact with 9A1D, a station in Croatia. Enkelena Haxhiu, one of our GSoC students, made contact with Z68AA in her own country, Kosovo. Anybody hoping that Albania was a suitably remote place to hide from media coverage of the British royal wedding would have been disappointed as we tuned in to GR9RW from London and tried unsuccessfully to make contact with them. Communism and royalty mix like oil and water: if a deceased dictator was already feeling bruised about an antenna on his pyramid, he would probably enjoy water torture more than a radio transmission celebrating one of the world's most successful hereditary monarchies. 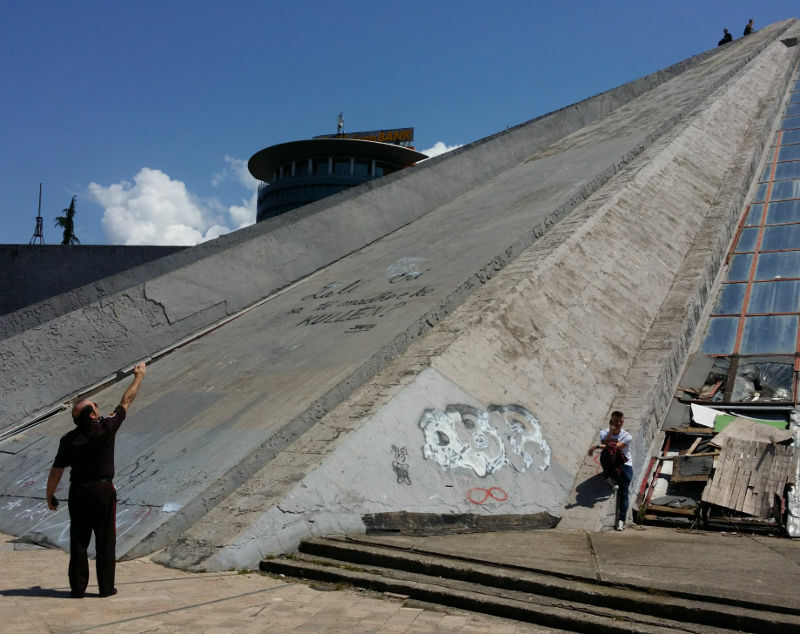 It isn't hard to imagine communist dictator Enver Hoxha turning in his grave at the thought of his pyramid being used for an antenna for communication that would have attracted severe punishment under his totalitarian regime. Perhaps Hoxha had imagined the possibility that people may gather freely in the streets: as the sun moved overhead, the glass facade above the entrance to the pyramid reflected the sun under the shelter of the marquees, giving everybody a tan, a low-key version of a solar death ray from a sci-fi movie. Must remember to wear sunscreen for my next showdown with a dictator. The security guard stationed at the pyramid for the day was kept busy chasing away children and more than a few adults who kept arriving to climb the pyramid and slide down the side. Debian has three Google Summer of Code students in Kosovo this year. Two of them, Enkelena and Diellza, were able to attend OSCAL. Albania is one of the few countries they can visit easily and OSCAL deserves special commendation for the fact that it brings otherwise isolated citizens of Kosovo into contact with an increasingly large delegation of foreign visitors who come back year after year. We had some brief discussions about how their projects are starting and things we can do together during my visit to Kosovo. On Sunday, 20 May, I ran a workshop Introduction to Debian and a workshop on Free and open source accounting. At the end of the day Enkelena Haxhiu and I presented the final talk in the Pyramid, Death by a thousand chats, looking at how free software gives us a unique opportunity to disable a lot of unhealthy notifications by default.